A liver surgeon who branded his initials on the livers of two patients has been fined £10,000. Simon Bramhall, 53, used an argon beam machine to write his initials on the organs of the anaesthetised patients in 2013 while working at Birmingham's Queen Elizabeth Hospital. Bramhall, of Tarrington, Herefordshire, admitted two counts of assault by beating at Birmingham Crown Court. He was also sentenced to a 12-month community order. But the donor liver failed about a week later - for reasons unconnected to its implantation - and another surgeon spotted Bramhall's initials "SB" branded on the organ. A photograph of the 4cm-high branding was taken on a mobile phone and Bramhall, who now works for the NHS in Herefordshire, later admitted marking Patient A's liver. Bramhall, 53, resigned from his job at the hospital in 2014. Image caption Simon Bramhall left one of his victims feeling "violated"
The consultant pleaded guilty to two counts of assault by beating in December after prosecutors accepted his not guilty pleas to charges of assault occasioning actual bodily harm. The offence of assault by beating was brought against Bramhall to reflect the act of marking the liver and there is no suggestion he was responsible for physically "beating" either patient. Prosecutor Tony Badenoch QC said one of the two victims was left feeling "violated" and suffered ongoing psychological harm. The court heard the surgeon's actions were a "naive and foolhardy" attempt to relieve tension in the operating theatre during transplant operations in February and August 2013. Simon Bramhall was a respected surgeon known for his meticulous work in the operating theatre. But marking his initials on the livers of his patients meant he abused his position and betrayed the trust of those who were at their most vulnerable. Even though the act of branding his initials didn't cause any damage to the organs, prosecutors argued it was done with a disregard to the patients' feelings while they were under general anaesthetic. This case has been described as "unique" and "without legal precedent in criminal law". It leaves surgeons facing further scrutiny legally - not just over medical mistakes for which they might be sued - but over what some might have regarded in the past as harmless medical pranks. It will be up to the General Medical Council to decide whether Bramhall will be struck off or allowed to continue doing the job he loves. 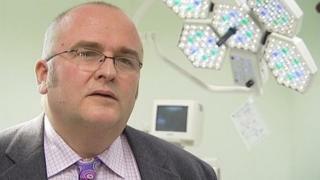 Acknowledging that Bramhall's actions had not caused either patient's new liver to fail, Mr Badenoch said: "This case is about his practice on two occasions, without the consent of the patient and for no clinical reason whatever, to burn his initials on to the surface of a newly-transplanted liver." A nurse who saw the initialling questioned what had happened and Bramhall was said to have replied: "I do this." Judge Paul Farrer QC, who said Bramhall would carry out 120 hours of unpaid work, told the defendant: "Both of the operations were long and difficult. "I accept that on both occasions you were tired and stressed and I accept that this may have affected your judgment. "This was conduct born of professional arrogance of such magnitude that it strayed into criminal behaviour. Speaking after the hearing, Frank Ferguson, head of special crime at the Crown Prosecution Service, refused to be drawn on whether Bramhall had carried out the practice on other patients but said he did not anticipate any further charges. Birmingham's Queen Elizabeth Hospital said Mr Bramhall had made "a mistake".